Governor outlines $2.5 bil ZEV plan. California wants to see at least 5 million zero-emissions vehicles on state roads by 2030 and Governor Jerry Brown has outlined a $2.5 billion plan to hit that target. The program would echo steps being put in place by several other countries that either already have or are, at least, considering moves to entirely ban use of the internal combustion engine. And it would run counter to steps being considered by the Trump Administration that may roll back the current Corporate Average Fuel Economy standards. 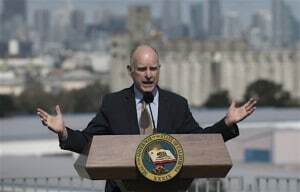 Brown, who has long positioned himself as an environmental advocate, previously laid out plans to put 1.5 million ZEV cars, trucks and crossovers on the road by 2025, up from around 350,000 today. The plan would address two issues that are commonly cited as obstacles to the widespread adoption of vehicles running on alternative propulsion systems: cost and range. California's had a waiver in the Clean Air Act to set its own emissions requirements to protect the Los Angeles Basin from smog. It would expand upon the Golden State’s current clean-car incentive program, which offers as much as $7,000 in subsidies to those who buy or lease a qualifying vehicle. The new program would cover not only battery-based plug-in hybrids and pure battery-electric vehicles, or BEVs, but also vehicles using hydrogen fuel-cells, making $200 million in subsidies available for each of the next eight years. 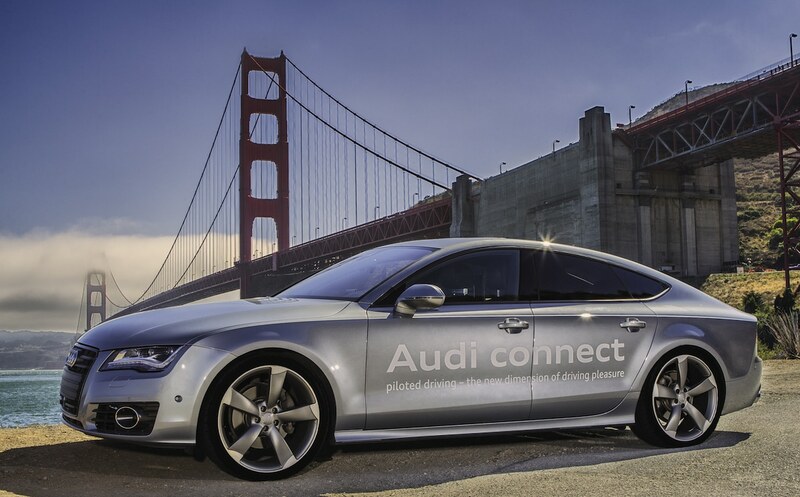 A key to the expanded program would be making it easier for motorists to recharge or refuel. Right now, there are just 14,000 charging facilities in California, but that would grow to 250,000 by 2030. The current 31 hydrogen pumping stations would grow to 200 under the plan. California has long had the ability to set its own automotive emissions standards under a waiver of the Clean Air Act. Officials, including Mary Nichols, the chair of the California Air Resources Board, or CARB, have been clear in their opposition to the Trump Administration’s environmental policies – and, in particular, to any possible rollback of the CAFE standards. Updated during the final year of the Obama Administration, the rules currently aim to increase the mileage of the average vehicle to 54.5 mpg by 2025. Any update to California’s rules could have a broader reach than just the state’s boundaries. Eleven other states have opted to follow the Golden State’s automotive emissions standards, rather than the less strict federal rules. 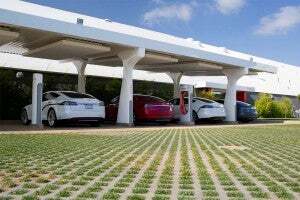 Tesla is expanding its Supercharger network in the U.S. and wants to convert them to solar power. “We think (Brown’s target) is a very reasonable proposal. It’s not a stretch,” said Nichols, noting that 40% of the vehicles sold in California by 2030 would have to use some form of zero-emissions technology, up from just 5% today. Though California has been far more willing to embrace green technology, observers caution that it is far from certain the new proposal will be enacted into law. It must win approval from the state legislature, for one thing. The governor’s plan would be funded by tapping revenues from some existing programs, such as the state’s cap-and-trade policy. Several automakers have laid out their own plans to help boost the availability of hydrogen refueling stations and electric charging stations. That includes Volkswagen which is expected to spend hundreds of millions of dollars in California to bolster a recharging network as part of its settlement of charges it rigged diesel emissions tests. Some critics question whether it would just move pollution, however, from tailpipes to smokestacks. But proponents point to California’s increasing use of wind, solar and other non-polluting sources for its energy grid. Perhaps the biggest question would be how consumers might react. California has the largest fleet of plug- and hydrogen-based vehicles on the road today, about 350,000 of them, all told. But even with cash and other incentives – including access to the coveted Diamond freeway lanes – sales have been growing rather slowly. But demand is expected to grow sharply with the introduction of new, long-range electric vehicles, including many targeting more mainstream price segments, such as the Chevrolet Bolt EV and Tesla Model 3. TheDetroitBureau.com currently counts a minimum of 25 long-range models that will be available in U.S. showrooms by 2020. 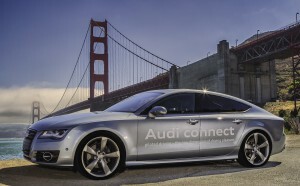 And, in recent months, a number of automakers have announced plans to ramp up their rollout of such vehicles. Two weeks ago, luxury brand Infiniti said it would go virtually all-electric by the end of the decade. Brown’s proposal is actually not the most aggressive one placed before California legislators. Assemblyman Phil Ting, a San Francisco Democrat, wants to ban gas- and diesel-powered vehicles entirely by 2040. That proposal is not expected to pass. But it echoes plans being considered in France and the UK, as well as Germany and China. Both Norway and India have put rules in place to phase out internal combustion vehicles by 2030. This entry was posted on Monday, January 29th, 2018 at and is filed under Advocacy Groups, Advocates, Automakers, Automobiles, Business, EVs, Fuel Cell, Hybrids, Markets, Personalities, Safety, Sales, Trends, U.S./North America. You can follow any responses to this entry through the RSS 2.0 feed. Both comments and pings are currently closed. Brown can start by not falsely calling those electric cars “zero emission vehicles.” He is also patently idiotic if he thinks that California needs to spends billions to reach his goal. In three years electrics will rule the roost, long after Pat (the Fol) Brown has squandered billions in a dopey attempt to reach that goal.